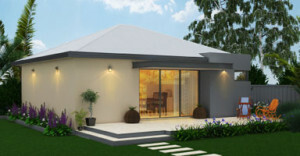 Today Granny flats are self-contained living units perfect for one or two people. Now they can be rented out to anyone you so choose and offer comfortable living spaces that range between 60 and 70 m². The designs range as well, offering traditional exterior designs that blend in with your existing landscape, or ones that act as a feature piece and draw the attention of those who passed by. Perhaps one of the biggest benefits to the self-contained living units is the fact that you can make the best out of the small space by cleverly converting what would otherwise be unusable space into a unique granny flat. Multigenerational housing has become a significantly more accepted form of living space. In addition to offering living space these granny flats provide many other advantages. The first advantages that you can rent out smarter and have greater security with another tenant living on the property. Tenants can also share in some of the amenities located in the main house while also sharing in transportation. In some cases they can share maintenance, childcare, or lawn care. Some people consider that these Granny flats are nothing more than glorified sheds that cannot possibly provide the insulation and comfortable living spaces that a renter would want, but this is far from the truth. In reality these homes are built to your exact specifications and their high-quality, double brick homes which are versatile and cost-effective. They include a living area, one or two bedrooms, a kitchen, and a bathroom and laundry room. You can now rent these out to earn extra income. In your residential area you are no longer limited to family members but instead can receive easy approval for a professional building company and enjoy complete construction within 10 to 12 weeks. This means that within a matter of months your granny flat will be complete and you can begin renting it out and enjoying the additional income brought about by a comfortable standard of living afforded by these units. When you opt to hire a professional builder to construct your granny flat design, from start to finish you can rest assured that the property will be fully insulated, all of the services will be connected, and the home itself will be built upon a solid concrete slab. This all means that you can enjoy increased rental income right now and increased sales at a later point in time when, if ever, you opt to sell your property. With self-contained units you can enjoy up to 18% rental yield because of the low building costs and the high rental returns. These buildings can bring you significant income like you never thought possible. If the building price is approximately $130,000, you can charge $370 in rent per month which accounts for 15% of your total cost. In addition to this benefit you also have the expediency with which the unit can be constructed; within 10 to 12 weeks from the moment you sign up your granny flat will be completed and available for renting.